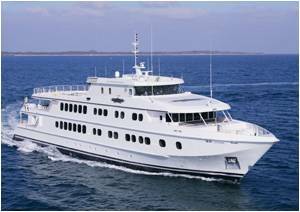 On Thursday 25th November 2004, North Star Cruises Australia celebrated the launch of the company’s new adventure cruise ship, the 50m, 36 passenger "True North". The ship will replace North Star Cruises existing 34 metre vessel, also named "True North". Following the announcement of the new vessel 12 months ago, the ship is to be launched in time for the 2005 cruise season (March onwards), following sea trials off Fremantle waters. The ship was built by Image Marine, a division of Austal Ships, builders of Greg Norman’s Aussie Rules. At a cost of $12 million, she represents the largest single investment in Western Australia’s marine tourism industry. The new "True North" features state of the art maritime systems, an internet cafe, forward Observation Lounge, and indoor/outdoor bar and our renowned chefs offering the "finest in fine dining". All cabins feature en-suite facilities, in-house entertainment and satellite telephones. A seven seater air-conditioned helicopter and six on board tenders allow guests to do "what they want, when they want" and access wilderness areas that remain largely unexplored. The launch was attended by family and company management. An official launch function for invited guests only is scheduled for early February 2005. The launch of the new luxury exploration vessel co-incides with North Star Cruise’s inaugural "Adventures In Paradise" cruise, featuring the untamed islands of Papua New Guinea in ultimate luxury. A privately chartered aircraft will transfer passengers directly on-board the vessel, via Cairns. Highlighting mighty rivers, impenetrable jungles, unique culture, smoldering volcanoes and a classic South Pacific vista. North Star Cruises, a West Australian owned and operated company, commenced operations in 1987 and is considered a pioneer of the luxury adventure cruise industry. They have won both state and national tourism awards and now offer adventure cruise options around the Australian coastline. North Star’s Kimberley Wilderness Cruise has become one of Western Australia’s most well known tourist attractions, with other cruise locations including Ningaloo Reef, Rowley Shoals (a coral atoll 300km east of Broome), and Darwin to Cairns (Over The Top). North Star Cruises will also be promoting the luxuriously appointed new cruise ship for the first time, at the international Luxury Travel Market Exhibition, in Cannes France next month.